Brana's son, my Uncle Max, wrote that other Boord family members that lived here were “mother’s sisters.” They were Aunts, Ratner, Nerochick and Rosenthal along with brother Shii Boord and Yankel Boord. The Ratner family members were Anna and Harvey, Miriam and Leo Ratner. Brana also had a sister named Etta Merochanik who had two sons Hyman and Sam Meyer who lived in Hollywood, Florida. My mother told me that Aunt Mary and Bebe also lived in Bridgeport with Brana since Aunt Mary and Uncle Jack separated. That is why Bebe knows so much about Brana and Henry since she lived with her grandmother for many years. My mother also remembers that whenever she visited her grandmother’s house, her grandmother was always cooking. I still remember how well my grandmother cooked, so Brana must have taught her daughters the necessary skills. 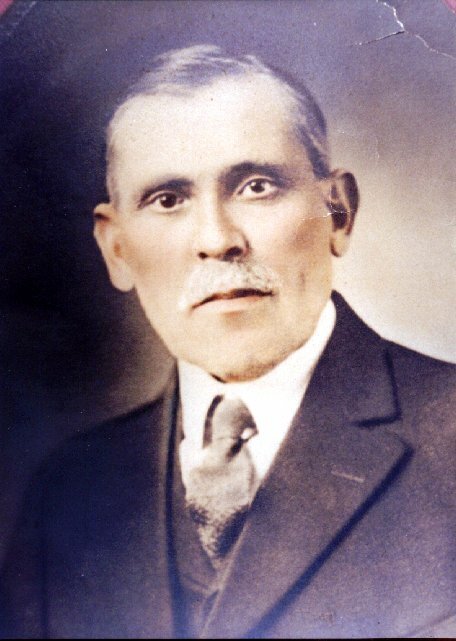 Henry died October 17, 1919 at the age of 51 of accidental mercury poising while he has hospitalized for a minor ailment. Cousin Kelman Cohen, who is a physician, said that the doctor gave Henry the wrong medicine, most likely to treat high blood pressure, that was intended for another patient. Henry thought the the medicine was wrong but Brana told him to take it. He said that he thought Brana may have felt guilty about this the remainder of her life. 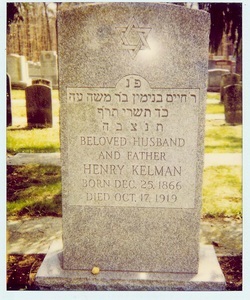 Henry Kelman is buried in the Jewish Cemetery in Carmel New Jersey in the town where he first lived when he came to the United States. I have always wondered why he was not buried with Brana in Bridgeport. 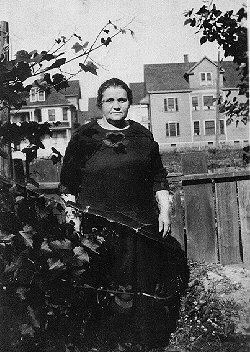 According to my cousin Todd Binns, his grandmother (my great aunt) Rae Kelman Schoenberg, said that her father was buried in Carmel because he was instrumental in helping to build the synagogue and the congregation there. Bebe told me that she and her son visited Carmel and actually saw the Synagogue that Henry helped start.It is a brick building that was still used at that time. Bebe visited her grandfather’s grave in Carmel, and incredibly enough, they met a man there who knew the Kelman family when they lived in Carmel. Brana died July 30, 1954 at the age of 81. She was living next to my grandmother, Rose Kelman Androphy, in Derby, Connecticut because Brana was very ill and needed care. I visited her there when I was very young. She is buried at the Loyalty Cemetery in Fairfield, Connecticut along with many other of our relatives on the Kelman side of the family. Brana and Henry lived remarkable lives. Much different from the way that we, their great grandchildren and great great children, live today. It could not have been easy leaving their home and family in Eastern Europe for a new land, language and culture. We owe them a debt of gratitude for their courage.